Ya Jagoff!!! | A Truly Unique Peter Parker! Home Parking Jagoffs A Truly Unique Peter Parker! Not much to add to this pic from Penn Hills! Of course, I used the Jagoff-estrator to point out the fire hydrant that this Peter Parker seemed to miss despite the fact that it is bright yellow with an orange top and there’s not a thing higher than it, in the this-has-been-the-longest-winter-ever brownish grass field! Maybe the car is part dog and it has to take a pee??? To repeat our Jagoff Catcher, “The whole street is open and ya pick the exact spot of the fire hydrant to park,” Ya Jagoff! 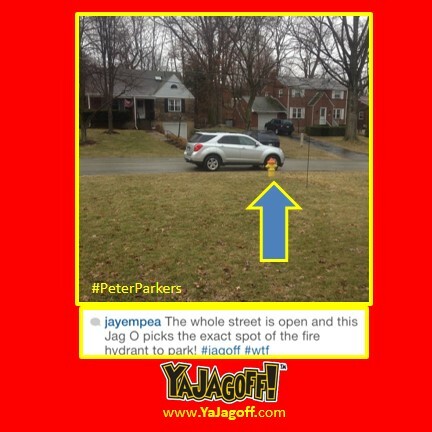 Thanks to @jayempea from Instagram for being the Honorary Jagoff Catcher!